From 19 October 2016 to 15 January 2017, the Städel Museum will present a comprehensive exhibition on one of the most outstanding draughtsmen in the history of French art – Antoine Watteau (1684–1721). The show in the Exhibition Gallery of the Department of Prints and Drawings will bring together fifty drawings by Watteau, enhanced by six of his paintings and a small selection of drawings by contemporaries and successors. Organized in cooperation with Teylers Museum in Haarlem, Holland, the exhibition “Watteau. The Draughtsman” will be the first monographic presentation of the artist’s work in Germany for more than thirty years. It will moreover be the first in this country devoted specifically to the phenomenon of Watteau in all his many facets as a draughtsman. Drawings served him as a basis for his painterly work. He drew continually and habitually, and in the most varied situations. The Städel has in its holdings altogether seven works from different phases of his career – and thus one of the most prominent Watteau collections in Germany. The precious sheets from the two institutions will form the exhibition’s core, and be supplemented by loans of high quality from collections in Germany, Holland, France and other European countries. Following its presentation at the Städel, the exhibition will be on view at Teylers Museum in Haarlem from 2 February to 14 May 2017. “Already the spectacular purchase of the painting The Embarkation for Cythera (ca. 1709–1712) in 1982 prepared the ground for the scholarly investigation of the works of Antoine Watteau at the Städel Museum. Our present comprehensive special exhibition on Watteau as an eminent draughtsman provides us with an opportunity to address ourselves to a further central aspect of his oeuvre”, comments Dr Martin Sonnabend, curator of the exhibition and head of the Städel’s department of prints and drawings to 1750. The French artist Antoine Watteau is one of the great masters of draughtsmanship. He was born in 1684 in the Flemish city of Valenciennes, which had been conquered by the troops of Louis XIV only shortly beforehand. Nothing is known about his early artistic training. In about 1702 he went to Paris, where he eked out a living for several years as an assistant to various artists, interior decorators and art dealers. It was around 1709 that he began to call attention to himself as a painter of works of his own. In 1712 the Paris academy admitted him to its ranks. From that time onward, he was highly successful above all with bourgeois connoisseurs and collectors, for whom he carried out paintings – for the most part small in format – of a novel subject, the fête galante (courtship party). The compositions show gatherings of young, elegantly dressed women and men in park-like landscapes, conversing, making music or contemplating nature. With their mix of reality and ideality, they catered to the taste of a generation that no longer found artistic appeal in the ponderous history paintings of the age of Louis XIV, works designed to represent the interests of the state. In Watteau’s courtship scenes, arcadian themes and traditions of Dutch genre painting join with motifs taken from the theatre of the artist’s time to create a reality considered free, indebted to sensory perception, and as immediately real as it was permeated with artistry. It took the generation following Watteau – who died of tuberculosis at the young age of thirty-six – to develop his approach further into the art that later came to be called “Rococo”. 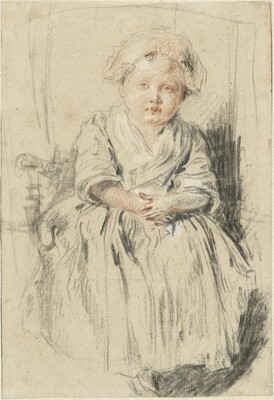 Drawings were the prerequisite for Watteau’s artistic production. His ability to capture his observations rapidly and confidently in red chalk enabled him to amass an extensive repertoire of motifs – primarily figural studies, but also landscape drawings and copies of works by other artists –; he then drew from this rich stock to devise the compositions of his paintings. Over time, by employing white and black chalk in addition to the red, he developed a virtuoso technique of stunning painterly effect. The immediacy of drawing provided him with an essential means of recording the fine nuances of reality that found their way into his scenes of courtship gatherings. Already his contemporaries recognized this special quality and collected Watteau’s drawings. His innovative style, characterized by a combination of precise observation, spontaneity, facility and intimacy, contrasts distinctly with the rigorous tradition to which the academically oriented artists of his time adhered. With its psychological sensitivity, the new, virtuoso art reflected the spirit of the incipient Enlightenment. The French Romanticists and the Impressionists considered Antoine Watteau one of their forerunners, and to this day we are amazed by the modernity of his works – especially his drawings. The Städel Museum has in its painting collection the earliest version of the famous The Embarkation for Cythera (ca. 1709–1712) which – also thanks to the other two versions in the Louvre and Charlottenburg Palace in Berlin – is presumably the artist’s single most famous composition. “Watteau. The Draughtsman” will enhance this work with five further paintings and fifty selected drawings. 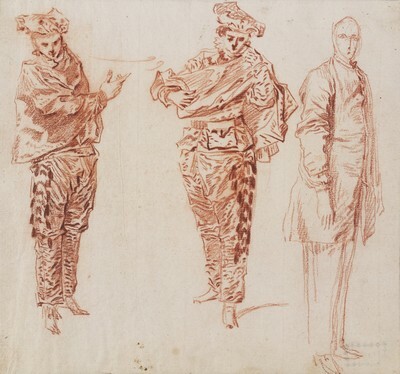 The presentation will begin with early drawings by Watteau showing figures from the realm of theatre as well as fairs and folk festivals. His early theatre studies of ca. 1709 to 1712 bear a direct thematic connection to the The Embarkation for (or Pilgrimage to) Cythera. In addition to the Städel Museum painting, this section will also feature preliminary studies of male and female models in pilgrims’ costumes. Watteau also devoted himself to other popular themes of his time, as seen in his soldier and hunting scenes. 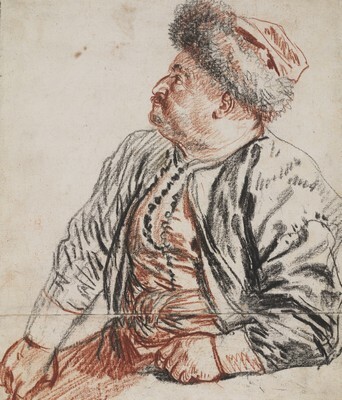 His drawings of members of a Persian delegation that visited Paris in 1715 testify to the draughtsman Watteau’s sublime mastery of the “three-chalk” technique. It was also around this time that he made his studies of the “Savoyards”, destitute street performers and merchants of the French capital. Following a section presenting Watteau’s drawings after works by other artists, the show will return to the most important theme in his oeuvre. After first appearing in the The Embarkation for Cythera, the subject of the fête galante continued to play a decisive role, characterizing Watteau’s work to such an extent that it came to be closely associated with his name. In his paintings he also turned his attention again and again to theatre as a medium that can present the world of feelings without the constraints imposed by societal or natural reality, and as an element combining the artificial and the real. The reflection on emotional events that already played a role in the artist’s investigation of theatre is also the theme of a further section of the exhibition. 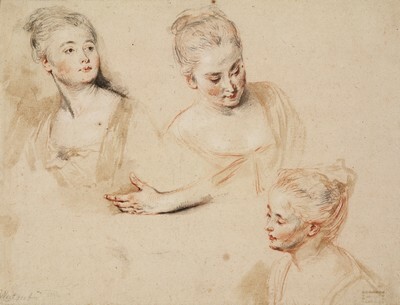 Here the focus is on drawings in which Watteau captured the gazes, thoughts and feelings of his models. The show “Watteau. The Draughtsman” will conclude with thirteen drawings by successors to the artist – among them Antoine Coypel (1661–1722), Nicolas Lancret (1690–1743), François Boucher (1703–1770) and Jean Honoré Fragonard (1732–1806) – from the Städel Museum holdings. 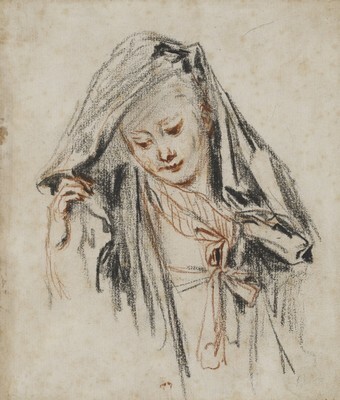 A publication of the years 1726–1728 containing 350 etchings after Watteau drawings (by, among others, François Boucher) will also be on display. A catalogue accompanying the exhibition will be published by the Hirmer Verlag with a foreword by Philipp Demandt and Marjan Scharloo. The publication will offer an introduction to the art of Watteau by Martin Sonnabend. Michiel Plomp (Teylers Museum, Haarlem) will investigate the artist’s exploration of the works of those “Old Masters” he chose – in the context of the drawing medium – as examples to emulate, and the Watteau expert Christoph Martin Vogtherr (Wallace Collection, London and designated director of the Hamburger Kunsthalle) will analyse various aspects of the specific strategies Watteau pursued as a draughtsman, which differed distinctly from the practices otherwise common in his day.